I culled this from my various MDS contacts upgrading to R75.40VS. All rumors. I know there is probably a command for this but I wanted to do some awk’ing. I know fwm dbexport will work on smartcenters. $MDSDIR/conf/mdsdb – Holds the data that supports the MDM environment. OK, so you can ignore ‘top’ command. Boned. I’m doing some sizing on our MDS boxes and came across this. I was using the GAIA memory usage tool and it reported different stats than top. In the example above, the system is mostly idling, with only OS processes running (‘cpstop‘ed the kernel). The OS reports “1272788” of “1295840” used. However, we see that the ‘free’ + ‘buffers’ + ‘cached’ = “23052” + “51200” + “996336” = “1070588”, which is ‘logically’ free for applications to use, and will be handed out by the kernel appropriately. So in reality there is more than 23052 of free memory, there is 1070588 of free memory. I heard about this and thought I’d flag it. SmartLog has one minor flaw. The index never gets smaller, it only grows. Ooooops. Even if you delete the log files, SmartLog index will continue to grow and grow. Oh well, Version 1 what can I say. You have to delete the whole data directory and let it re-index. Now everything is a Mgt + container. So if you have 1000 domains on a single P1 and its all blowing up because 32 bit just doesn’t handle things like backup, then you need to spread things around a bit. So you buy a couple more MDS servers and import/export the domains from the primary down to the secondaries. 1) Well, the secret is create just 1 ONE primary MDS. Then create all secondary OR MLM MDSs after that. This is how you get a SIC so you can register them with the primary. 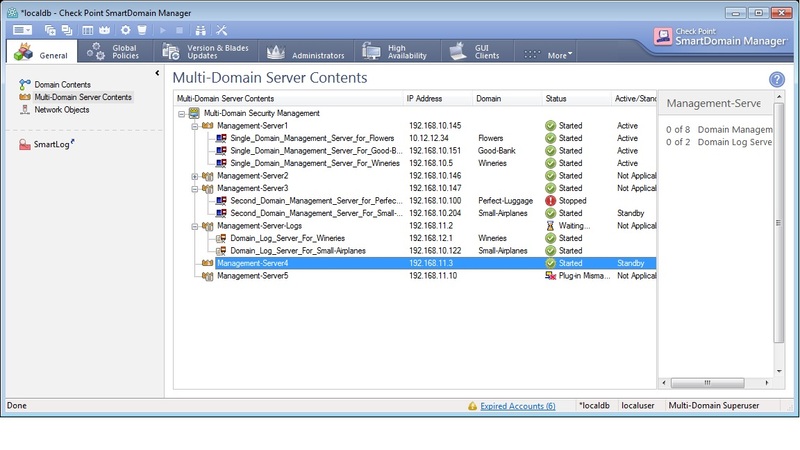 If you need HA, then create a secondary MDS and use the mdscmd mirrormanagement command to mirror the source MDS server. This MDS unit will only contain mirror domains, you can’t create unique instances of domains, they will get mirrored/synced to the source MDS. Oh yeah, did I tell you the documentation is all horked? Just throw it away and do what I tell you. So there….I admit I was wrong but I figured out the real deal. Thanks to Check Point Support and Ofer Orr at Check Point for the tips. You people rock. Did you ever shoot yourself in the foot? Publish something on the web that was totally false? R75 got rid of specifying containers, vs mgt+containers vs mgt standalone on install. So Dreezman goes and shoots his mouth off the containers are gone. Containers are back and its cool. In reality all MDS installations are both MGT and Containers. As you add MDS units, they join the MDS cluster and synch the global database. Almost like VMotion….Well, not quite but 10% the way there. Very cool. So I am cancelling the end of the world. You can have infinite domains once again. And you might want to do that because backing up over 50’ish domains will blow up tar.